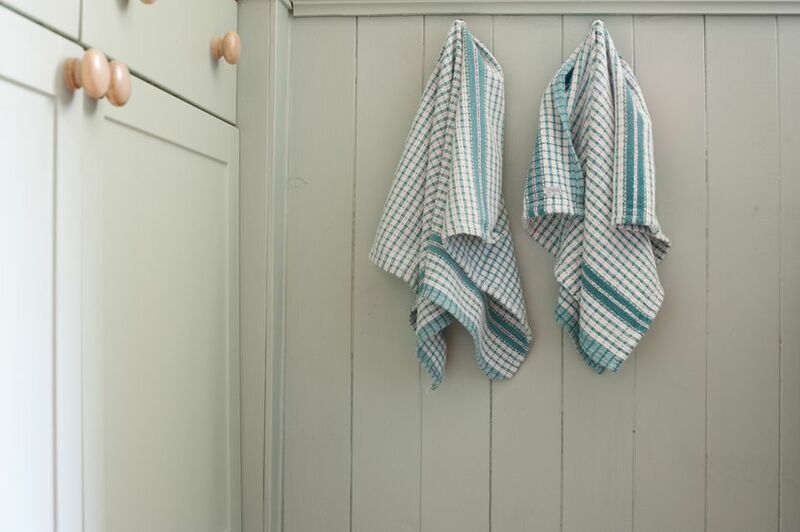 Hanging dish towels are a great way to have towels ready where you need them when you need them. The loop allows you to hang it all sorts of places in the kitchen or bathroom. They are also a great gift for almost any holiday done with holiday fabric and towels that you buy on clearance to save money. They're a really versatile gift, good for weddings and housewarmings alike. If you know a student heading off to their first dorm a dish towel in their new school colors would make a unique and useful gift. Dish towels are a household necessity especially if you have children, this pattern will make them even better to use. Standard dish towel, cut in the middle leaving both ends intact. Cutting: Cut a standard dishtowel in the middle leaving both ends intact. Use the line on the pattern to lay the pattern on the lengthwise grain of the fabric. Pin in place. Cut out two of the pattern pieces. With right sides of the fabric together, using 1/2" seams, stitch around the curved edges of the pattern, leaving the bottom open. Trim and notch seam where necessary. Turn right sides out. Press smooth so that all seams are on the edge. For a pleated type of towel: Mark in 1" from the end of your dish towel. Fold at this mark and meet in the center. Stitch into place and zig-zag or serge raw edge of the towel. For a gathered type of towel: Gather the raw edge of the towel so that it will fit the open area at the bottom of the pattern. Set the towel on one layer of the joined fabric pieces at the bottom opening. Pin in place between the seams. Sew the towel to the fabric using a 1/2" seam. Press the seam to the inside of the fabric pieces. Press under the other layer of the fabric. Topstitch the fabric through all the layers. Make a button hole, sized to your button or to your knob size, depending on which version you are making. Be creative and embellish the towel or top with lace or embroidery. Choosing a kitschy fabric with their favorite tv or video game characters is great for a young adult. Many unique fabrics can be found online that cater to pop culture enthusiasts. If you are using a limp fabric, you may want to interface the fabric area. Serging or zigzagging the raw edge of the towel, before assembling it, adds strength through many launderings. Use holiday fabric to make them for every holiday.